What Are Net Carbs and How Do You Calculate Them? If you’re one of the millions of Americans trying to lose weight, you’ve likely been told to track and limit your carbohydrates (carbs) in addition to calories. This article explains everything you need to know about net carbs, including how to calculate them and whether fiber of sugar alcohols have any calories. What Is a Net Carb? The Food and Drug Administration (FDA) does not recognize the term net carbs. Instead, the concept of net carbs was likely a legacy of the Atkins Diet era. To calculate net carbs, fiber and sugar alcohols are subtracted from the total carbohydrate amount listed on the Nutrition Facts panel. For example, let’s say a protein bar has 30 grams of total carbs, but 20 of those carbs are fiber and 5 are sugar alcohols. Subtracting the fiber (20 grams) and sugar alcohols (5 grams) from the total carbs (30 grams) would give you 5 grams of net carbs. The theory behind this is that because fiber and sugar alcohols do not significantly affect blood sugar like other sources of carbohydrates they are ignored. But this is not entirely accurate. In order to fully understand why, a quick primer on carbohydrates is needed. Carbohydrates (like proteins and fats) are macronutrients, meaning you body require large amounts of them. The primary role of carbohydrates is to provide your body with energy. Carbohydrates can be divided into four general types: monosaccharides and disaccharides (sugars), oligosaccharides (chains of three to 10 sugar units), and polysaccharides (starch and dietary fiber). When you consume a carbohydrate-containing meal, most of the carbohydrates are broken down into individual glucose — or sugar — molecules. Some carbohydrates, however, can’t be broken down at all, whereas others are only broken down partially. These include fiber and sugar alcohols. Unlike starch or sugar, humans lack the necessary enzymes to digest fiber. In the diet, fiber presents itself as insoluble and soluble. About two-thirds of dietary fiber is in the form of insoluble, while the other third is soluble. Insoluble fiber does not dissolve in water and provides bulk to stools helping to prevent constipation. This type of fiber leaves your intestines unchanged and provides no calories. In contrast, soluble fiber dissolves in water and forms a gel in your stomach helping to slow digestion and provide satiation (1). In your large intestine, soluble fiber is fermented into short-chain fatty acid (SCFAs) by bacteria which confers a wide-array of health benefits (2). This fermentation process, however, does provide calories. The fermentation of one gram of soluble fiber to SCFAs provides approximately one to two calories (3). 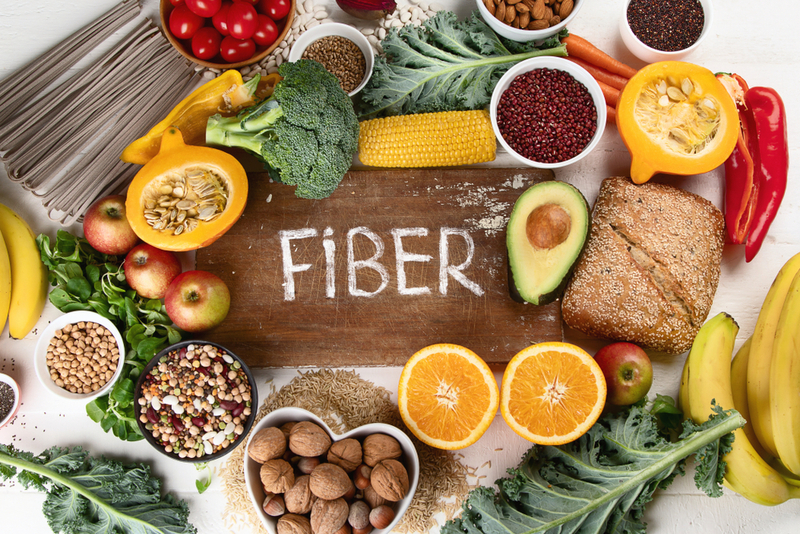 Therefore, because about one-third of dietary fiber is soluble, a serving of food containing six grams of fiber would contribute between two and four calories. Most fiber can be completely subtracted from the total carbs listed on the Nutrition Facts panel. But, if the fiber isomaltoologosaccharide (IMO) is listed in the ingredients, subtract half of the fiber from the total carbs listed. Sugar alcohols occur naturally in a wide-variety of fruits and vegetables, but they are also produced from carbohydrates. Despite its name, sugar alcohols are neither sugars nor alcohols (ethanol). Instead, they are carbohydrates with a chemical structure resembling sugar and alcohol. Commonly used sugar alcohols include: erythritol, isomalt, maltitol, mannitol, sorbitol and xylitol. Sugar alcohols are incompletely absorbed and metabolized by your body, but they still contribute calories — around two per gram (4). The outlier is erythritol which contributes zero to 0.2 calories per gram. Therefore, generally speaking, half of the carbs from sugar alcohols can be subtracted from the total carbs listed on the Nutrition Facts panel. As you can see, calculating net carbs is not as simple as subtracting fiber and sugar alcohols from total carbohydrates. The type of fiber, sugar alcohol, and any combination of the two makes the concept of determining net carbs far from perfect. Nevertheless, it’s important to remember that the term net carbs on packaged foods marketed as low carb or low sugar can be misleading and may not reflect the actual number of carbs your body absorbs.